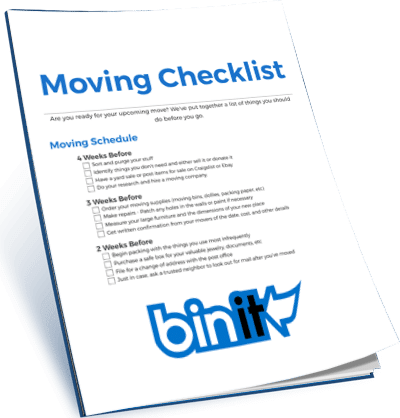 Bin It now offers Updater to their customers in New York, New Jersey, Nashville, Indianapolis, and Washington D.C.! Bin It​ has partnered with Updater, an automated and guided web application that eases the moving process, to provide their customers with a seamless moving experience. Update Accounts:​ Users can automatically update account records for up to 15,000 business, including magazines, newspapers, alumni associations, charities, retailer loyalty and frequent flier accounts. Connect Home Services & Utilities:​ Updater helps customers transfer utilities, set up digital services and schedule in-home installations. Forward Mail: ​Updater files each customer’s official U.S. Postal Service mail-forwarding form; customers never have to set foot in a post office. Send Digital Moving Announcements:​ Customers can notify friends and family that they are moving with a custom digital e-card to post on social media or send via email. Claim Move-in Offers:​ Updater provides special offers and exclusive deals on moving services and expenses, such as discounts on professional cleaning, moving companies, cardboard boxes, recycling bins, and more. Updater makes moving easier for the 17 million households that relocate every year in the US. With Updater, users seamlessly transfer utilities, update accounts and records, forward mail, and much more. Hundreds of the most prominent real estate companies in the US (from real estate brokerages to multifamily and relocation companies) rely on Updater’s real estate products to save clients hours with a branded and personalized Updater moving experience. Headquartered in New York City, Updater has raised over $50 million from leading investors, including SoftBank Capital, IA Ventures, Commerce Ventures, Second Century Ventures (the strategic investment arm of the National Association of Realtors®), and more. For more information, please visit www.updater.com.